Woods N’ Water designer color series boat docks. Rich earth tones. Warmth is more than the sun on your face, more than the midday breeze. Warmth is taking a comfortable chair at water’s edge, savoring the shades of hills and shore. Knowing you are truly where you belong. The familiar light shades and deep tones of your shore are captured in Woods N’ Water. Calm and graceful, it’s your invitation to relax in comfortable surroundings and enjoy the warmth of home on the water. Woods N’ Water designer color series boat docks are available in any of the boat docks styles we offer, and feature burnished slate roofing, burnished slate railings, and buckskin decking. 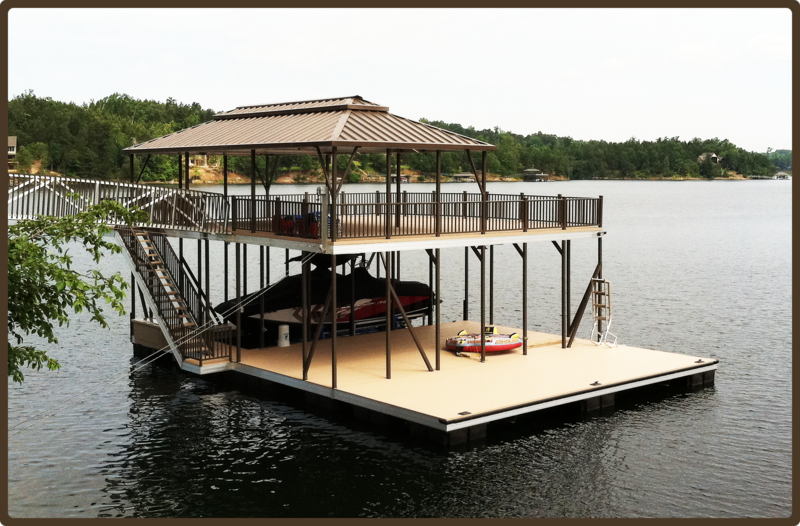 Contact your dealer or Flotation Systems directly for more information on ordering your new designer boat dock.